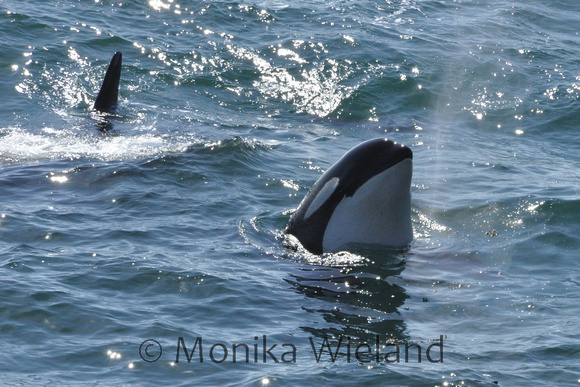 I was in dire need of what we orca-holics call a "whale fix". 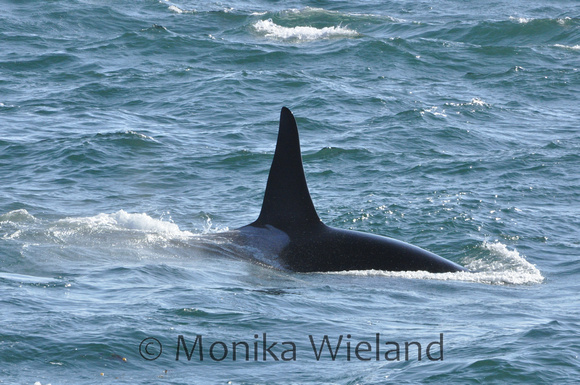 The weather's been nicer, the whales had been around more, and I had yet to see them. 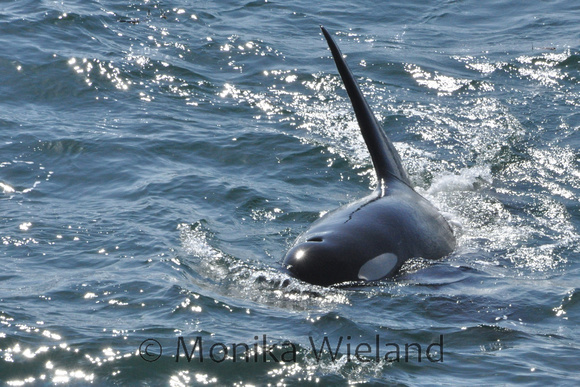 With reports Thursday and Friday of L-Pod coming down the Inside Passage and J-Pod having returned to inland waters a couple days before, it felt like the stars were finally aligning for me to have a great whale day on Saturday. Wow, was that ever true! 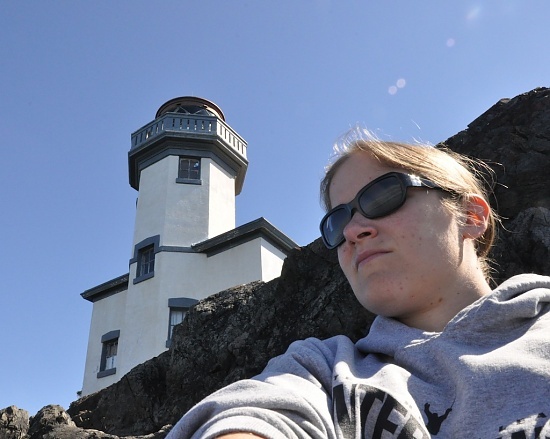 I packed a lunch and a couple magazines and headed out to Lime Kiln Point State Park with the intention of spending most of the day there on Saturday. 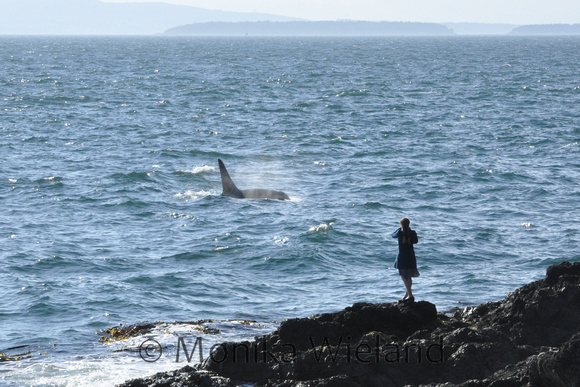 No one knew where the whales were exactly first thing in the morning, but J-Pod turned up heading down Boundary Pass and a couple hours later they passed by heading south, where I gladly watched them from "my rock" in front of the lighthouse. 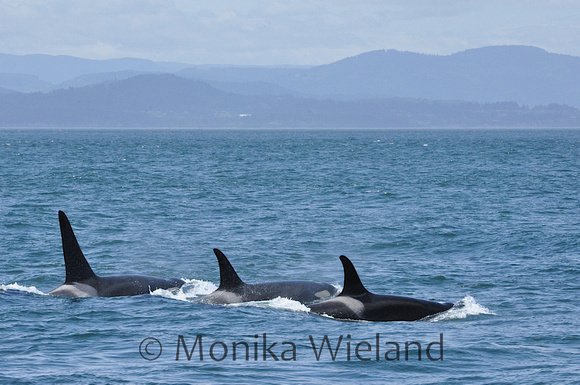 They were spread out into their family groups, which was a nice way to reunite with all the members of J-Pod for the season: the J16s in the lead; J2, J8, J19, and J41 next; the J14s offshore; the J11s with L87; and finally the J22s. The two pods met up a little ways north of Lime Kiln, and then headed south again in one big group a little ways offshore. By this time, the windy forecast started to come to fruition and the waves were picking up. I had a hunch the whales would head back north again, but in my experience they don't usually come very close to shore when the water's choppy. I watched for a while and noticed they didn't seem to be receding into the distance in the south very far. The whale-watching boats were still hanging out within view and I could see the occasional blow, so I decided to go down the shoreline to Land Bank to see what was going on. 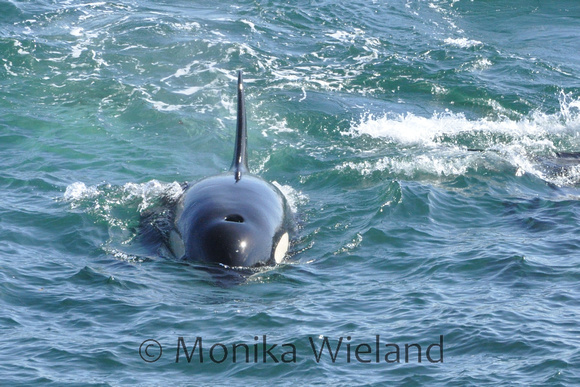 What I saw during the next hour from Land Bank is one of my most memorable whale encounters ever, and after 12 years of watching orcas that's saying something! Out the window went my theory about the whales not coming close to shore in rough water, and what took place was like nothing I've ever seen before. 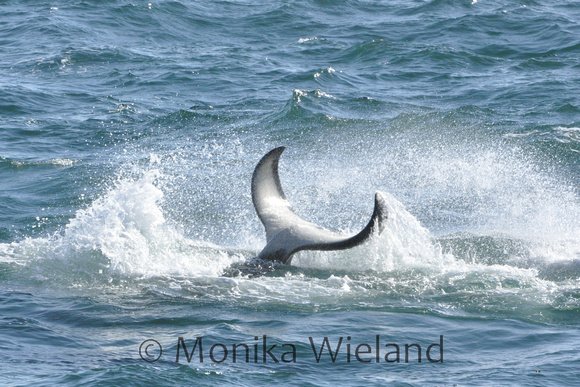 The whales were surfacing slowly in groups, at times just hanging at the surface letting the waves wash over them. The two pods were all mixed up, and with all the rolling around and playing they were clearly enjoying each others' company. Jeanne, who joined me at my overlook partway through, described it as a "water ballet", and I have to say that's a pretty good description. The different groups just went back and forth for over an hour, wowing us shore-based viewers. One reason I've taken a few extra days from when this happened before posting this entry is because I wanted to take some time to go through my hundreds of photos (I maxed out my camera memory card for the first time ever!) to try and ID some of the whales. This was challenging, because in the late afternoon backlit lighting and with choppy water, seeing saddle patches wasn't easy. Still, I love figuring out who is associating with who, because it offers a glimpse into the otherwise mysterious killer whale society. 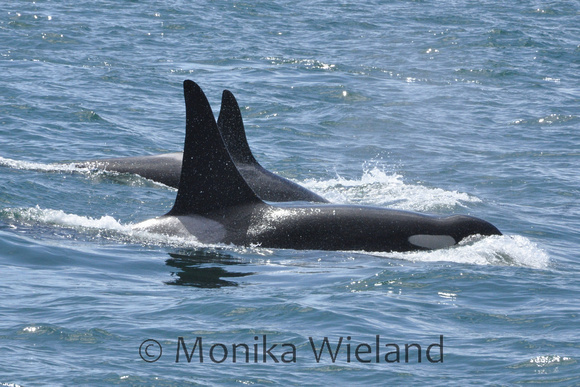 For instance, 19 year-old male L89 Solstice was perhaps getting a bit of a sexual education from the post-reproductive female J8 Spieden, who is an estimated 77 years old. 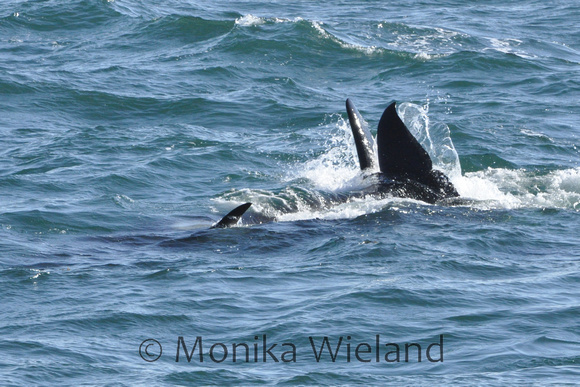 The two were being very touchy-feely with one another, with Solstice at one time lifting Spieden out of the water! At one time the two of them were facing the same direction, side-by-side, just hanging at the surface as the waves washed over them. It was beautiful. 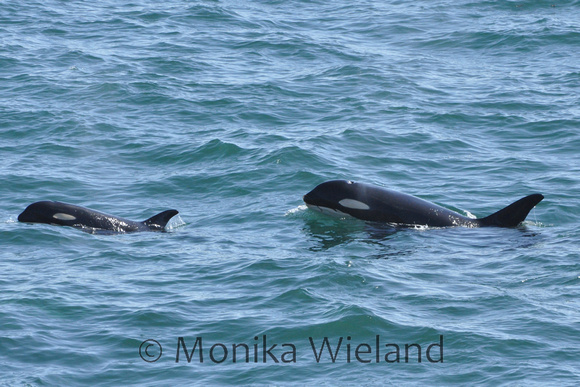 L87 Onyx is an interesting whale who has switched pod associations several times since his mother died in 2005. 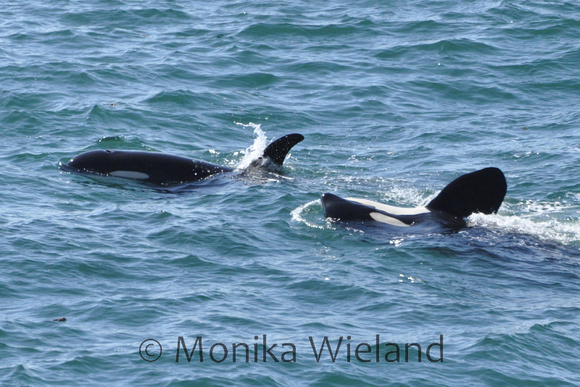 His current association is with J8, and it was cool to see him reunited with his natal family group in the L12s (L89, despite being only a year younger. is possibly Onyx's nephew). 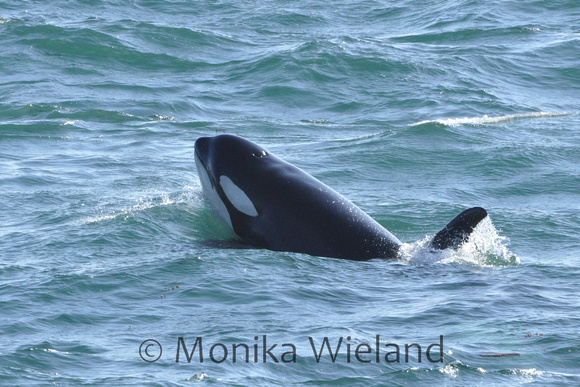 You can read more about Onyx's story here, but on this day he spent a lot of time in close association with L41 Mega, a 35 year-old male that he would have spent a lot of time with growing up, who he now only sees occasionally. 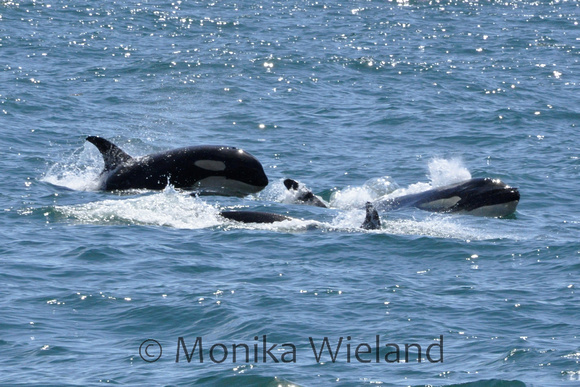 While the adults were catching up, a group of moms and youngsters was having a good time playing together. 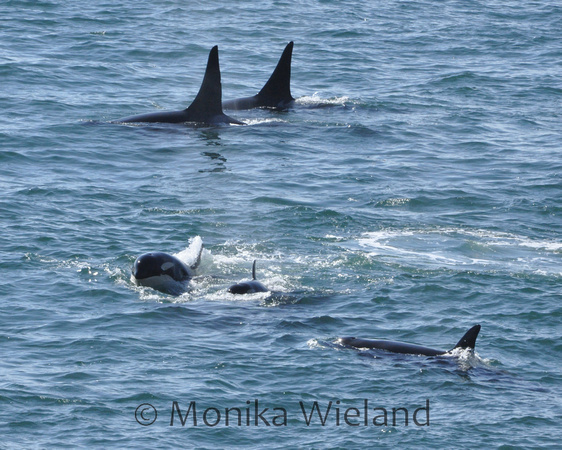 There were more whales than this in the group, but I was only able to figure out for sure that L94 Calypso with calf L113 Cousteau were there along with J19 Shachi and J41 Eclipse. 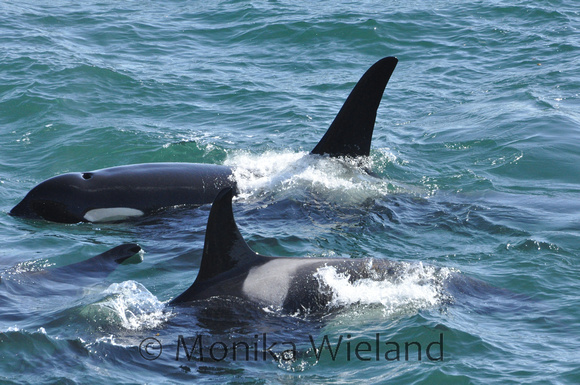 At one time, a mama was pushing her calf at the surface, a playful beahvior that's probably the orca equivalent of a piggyback ride. A bit later the J14s and J22s joined in on the action. Believe it or not, for someone who spends so much time watching whales on the west side, I was watching all of this from a location I've never watched whales from before (you may notice the perspective is a little bit more looking down on the whales rather than straight out at them - usually I try to get as close to water level as I can!). 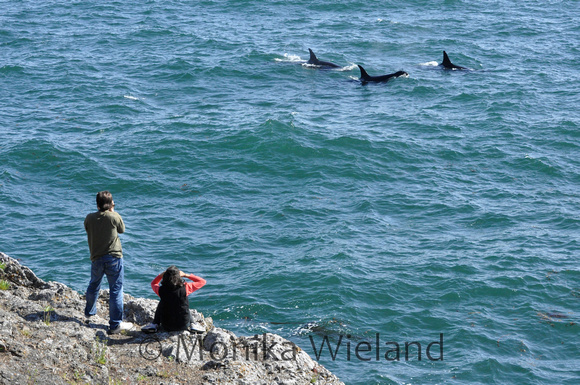 One advantage of a bit of a higher perspective is being able to get whale watchers in the foreground. Usually this is something I like to avoid, focusing my camera instead on just the whales themselves, but this was actually pretty cool. 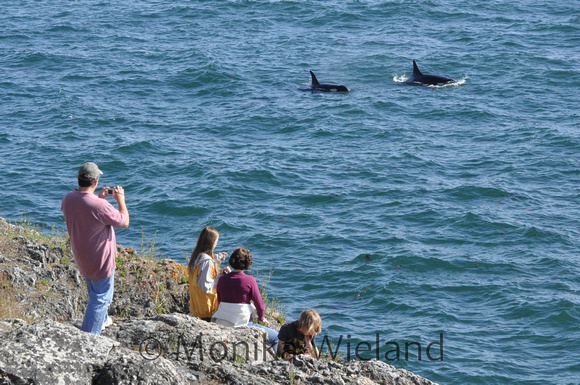 It brought me a lot of joy to be able to share these photos with the people in them, who were seeing orcas for the first time, a few days later. 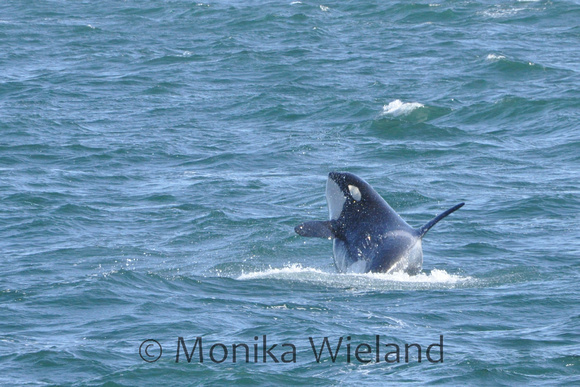 Finally, the whales started moving north. By this point, I had been on the westside almost eight hours, five of which had been spent with whales in sight, and I was hungry and sunburned, but had I had enough? Of course not! 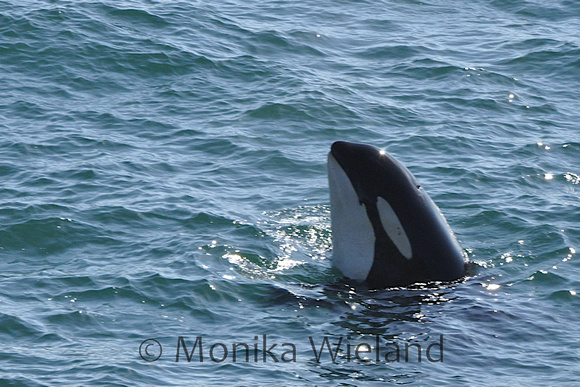 The whales were traveling so slowly that I went back to Lime Kiln and got to see the last of them pass by again. 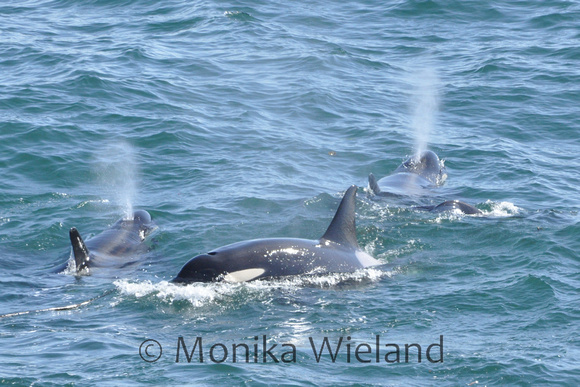 To see these and other photos from Saturday's encounter with J and L Pods, click here, to view them individually or as a slideshow. I loved your post, enjoyed all of the photos and am so happy you got to have that experience. Looks like you had a most awesome and briliant day. Like the pic of Blackberry in 'rough' seas - that's not far off mirror calm for us! so cool, monika! i am on my way and will be there monday. 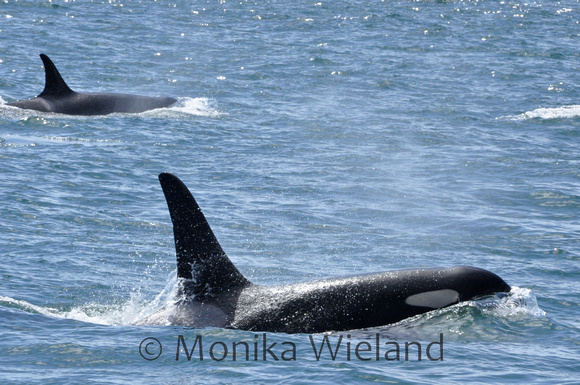 can't wait to see the orca gang and watch those whales with you. woo hoo! loved the pictures and I am glad you got to see them. 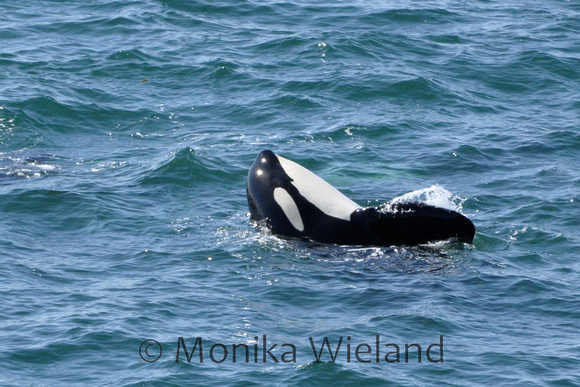 I haven't been whale watching but saw one in CA once. I was very pleased to read this site.I wanted to thank you for this amazing read!